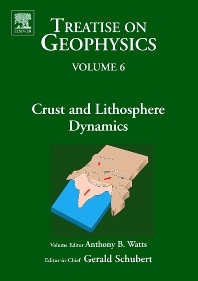 Treatise on Geophysics: Crust and Lithosphere Dynamics, Volume 6, provides a comprehensive review of the state of knowledge on crust and lithosphere dynamics, which is defined as the study of how the outermost layers of the Earth respond to loads that are emplaced on, within, and below it and its implications for plate mechanics and mantle flow. The book begins with a chapter on plate kinematics, which shows how new observations and methodologies have improved the resolution of relative and absolute plate motions. This is followed by studies of plate mechanics, focusing on the long-term rheology of the plates and response of the plates to both relatively short-term and long-term loads. The book also includes chapters that examine the evidence from surface heat flow, borehole breakouts, and magma models for the thermal and mechanical structure of the lithosphere; the deformation of the lithosphere in extensional and compressional settings. The final two chapters deal with the structural styles of faulting in the shallow brittle part of the lithosphere, the brittle-ductile transition, and the shear zone in the ductile part of the lithosphere; and how developments in plate mechanics have impacted our understanding of geological processes. Geoscientists, including seismologists, volcanologists and other researchers and students with an interest in the tectonics of the lithosphere.